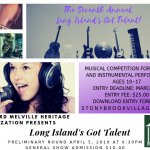 Open to students 10 – 17 years of age in Nassau or Suffolk County who must still be in high school at the time awards are given at the finals in October 2019. Talent must be non-professional vocal or musical instrument performances. No bands please. 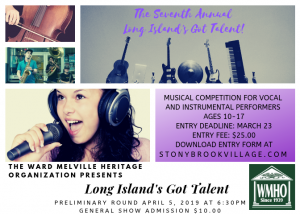 Call for entry form or download at stonybrookvillage.com. $25 Entry fee.